ALWAYS remember to switch your handphone to Airplane Mode, to avoid getting billed unnecessary. If you have a handphone with Dual-Sim capability, REMEMBER to toggle your Internet settings to use the non auto roaming telco for data transfer. In Malaysia, there are a number of telcos offering Traveller’s SIM Card (a package that commonly includes voice and mobile Internet services). 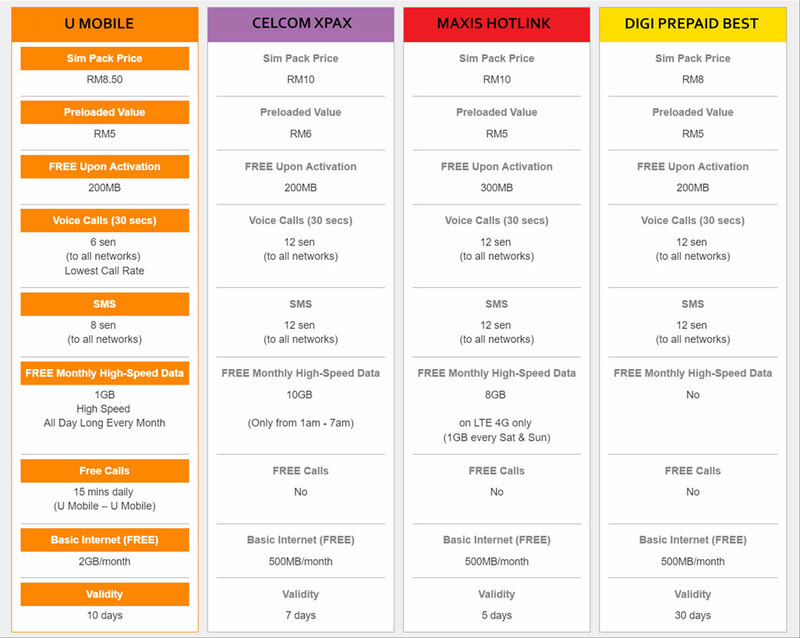 In this article, I will do a breakdown of the Top 4 major telco’s price plan and finally end with a recommendation of my own. Always a leader when it comes to introducing new price plans for consumers. Ultimately, its the end users who benefit from the constant review. Their packages are highly configurable and affordable, but probably lacking in the coverage areas. Still it’s worth considering if you are spending most of your time in the city. Conclusion – If I spent majority of my time in the city, then U Mobile is the choice for me – Flexibility at affordable costs. If you are looking for private taxi service during your holiday in Malaysia, feel free to contact us.